Note: Dan McIntyre has been volunteering as a science and technology consultant with Project Zawadi for the past year. Dan’s recent trip to Project Zawadi’s base of operations in rural Nyamuswa was to visit and evaluate the science capabilities and clubs at four of the schools that will be participating in Project Zawadi’s new Model Schools program. 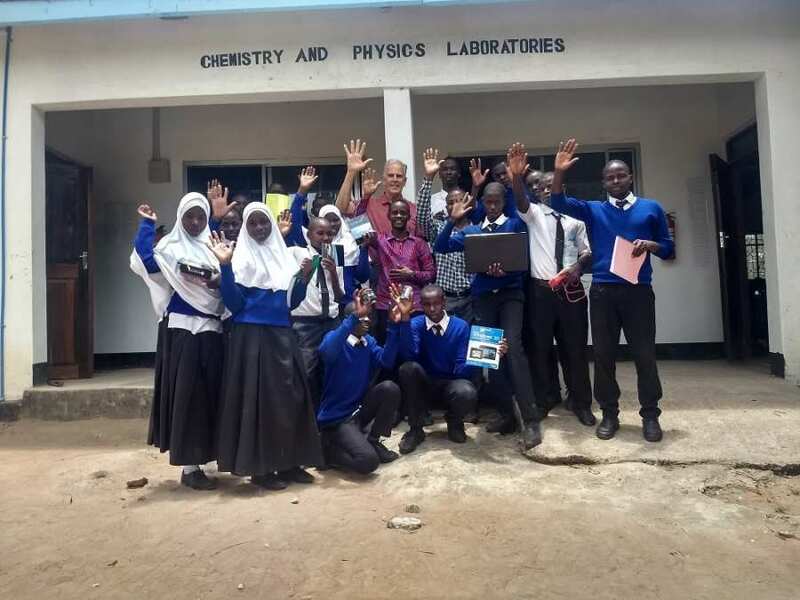 Last fall, I traveled to Tanzania and spent two weeks in Nyamuswa evaluating science activities at two primary and two secondary schools that are part of Project Zawadi’s Model Schools program. I brought with me two computers loaded with educational materials to be used by science clubs at the secondary schools (see resource listing at the end of this article), a projector in order to be able to share this content with students in their classrooms, and some materials to be able to conduct science activities. Shika na Mikono is a set of manuals that were prepared by Tanzanian teachers and US Peace Corps Volunteers. Translating as “Hands on Activities”, these manuals serve as a guide for teachers to conduct science activities in village schools using available resources. Copies of the Shika na Mikono manuals for the subjects of Biology, Chemistry, Physics, and Mathematics were printed in the nearby town of Bunda so that each secondary school would have a copy. The manuals follow the Tanzanian syllabus, so it is easy for teachers to find an activity for each week’s learning topic. The manuals are great guides for teachers who might not otherwise have much experience with doing science activities. I spent several days at Nyamang’uta Secondary School, which is the secondary school where Project Zawadi Director Adrian Maganga was headmaster. It is a newer school and still building infrastructure. They do not have a science laboratory yet. It will soon be wired for electricity, but when I visited only the teachers’ housing had power. Extension cords allowed us to use the computer and projectors to show Swahili videos on sexual health to the students. 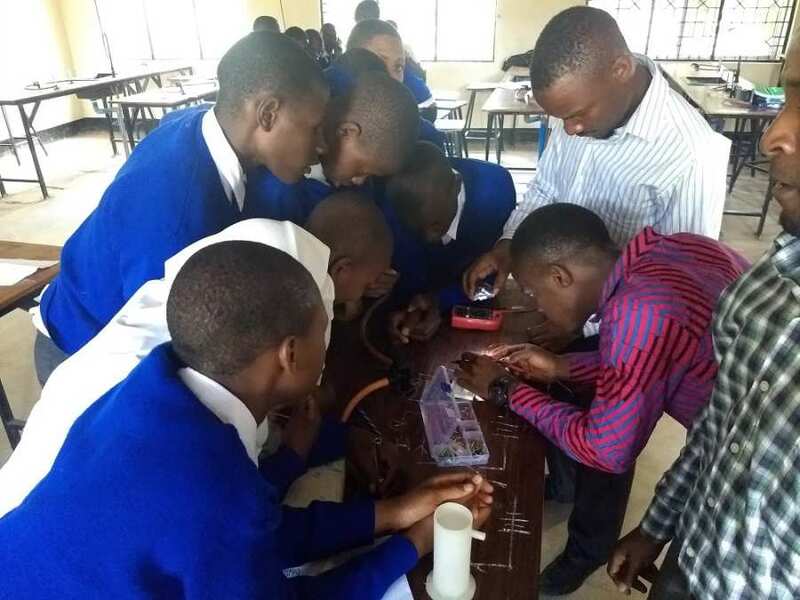 The science teachers at Nyamang’uta then organized the students to do some hands on chemistry experiments, including making a sand water filter and creating hydrogen gas. The next day I returned to the school and discussed with students how computers work. Students had a chance to use the computers to explore the educational content. I was surprised at how interested they were in the English-language science videos, which they said they understood with the help of the visual context. Girls watching a video in Swahili on reproductive health. 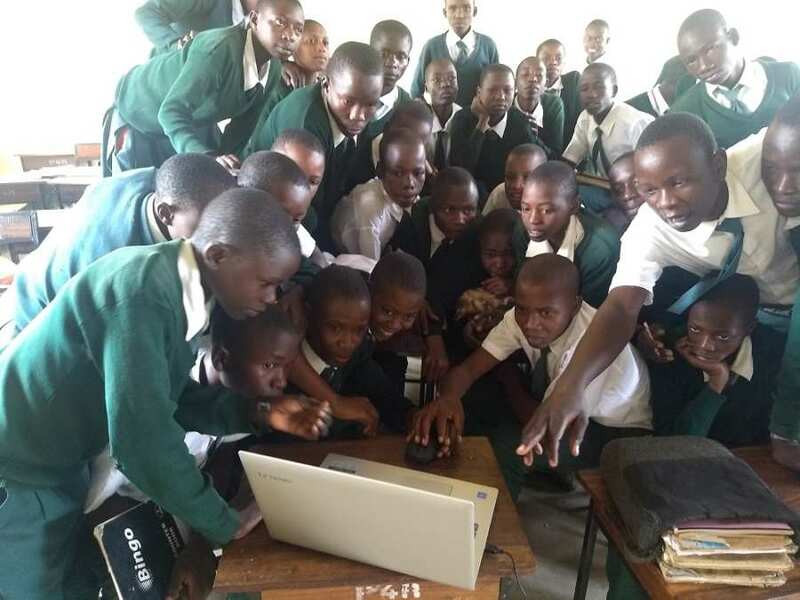 Students watching science videos on computer. I then visited nearby Makongoro Secondary School. Older and larger than Nyamang’uta, Makongoro has nice science laboratories with benches, gas burners, and sinks. Makongoro has a functioning science club and I met with those students. One student prepared soap from sunflower oil using a procedure from the manual and the students were actively exploring the science content on the computer. Since I’ve been back, I have heard from the science teachers that the students are meeting every Friday to explore the content on the computer and to conduct science activities. Students creating an electrical circuit and testing it with a multimeter. Busore has an existing kit of materials for science activities which is being stored in the head teacher’s office. It doesn’t appear to be regularly used. After a tour of the school, a teacher and I did some simple science activities with her classes using balloons and handheld microscopes. This teacher spoke excellent English and is now helping with Project Zawadi’s English Bridge Program. After the activities, we were able to set up the projector in a classroom and showed health videos in Swahili on topics of sexual health, safe water, and cholera to the older students. 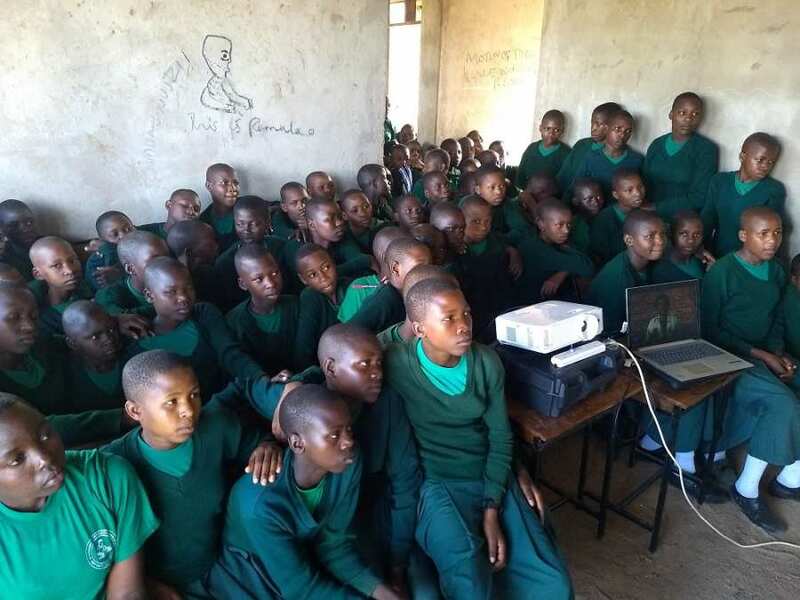 The younger students watched a cholera animation and some videos in English from Planet Earth, which were explained by Project Zawadi staff in Swahili for the students. Students seeing dots of the three primary colors in printed pictures. 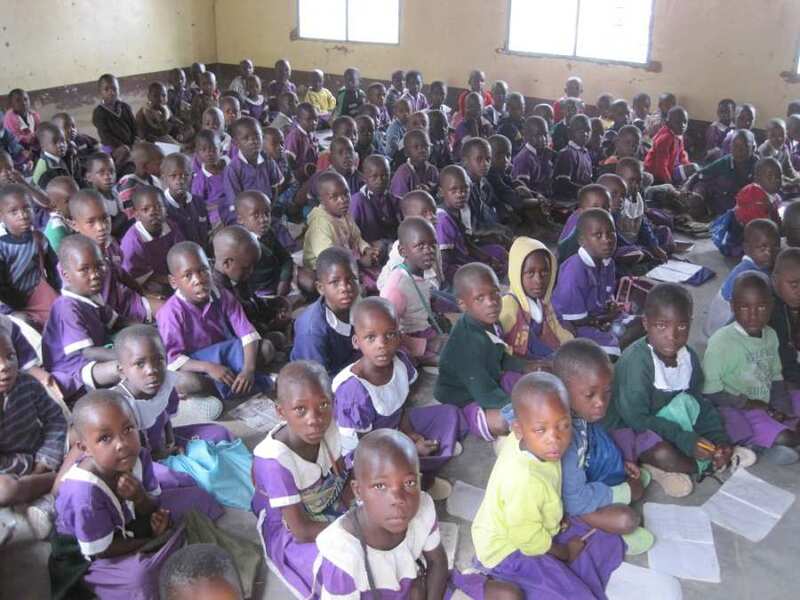 Attentive Kindergarten students at Busore. The Ward Education Officer asked us to conduct a training session for teachers from several local schools on science activities for primary school. Science students and teachers from Makongoro and Nyamang’uta Secondary schools presented some demonstrations to 10 primary teachers and a group of selected students from Sarawe Primary. The teachers were very interested in the activities and decided to form a group to share science activity tips and ideas using “What’s App” on their mobile phones to communicate. Shika na Mikono manual activity using locally available materials to demonstrate the concept of mechanical advantage. In Tanzania, the language of instruction switches from Swahili to English when a student enters secondary school. 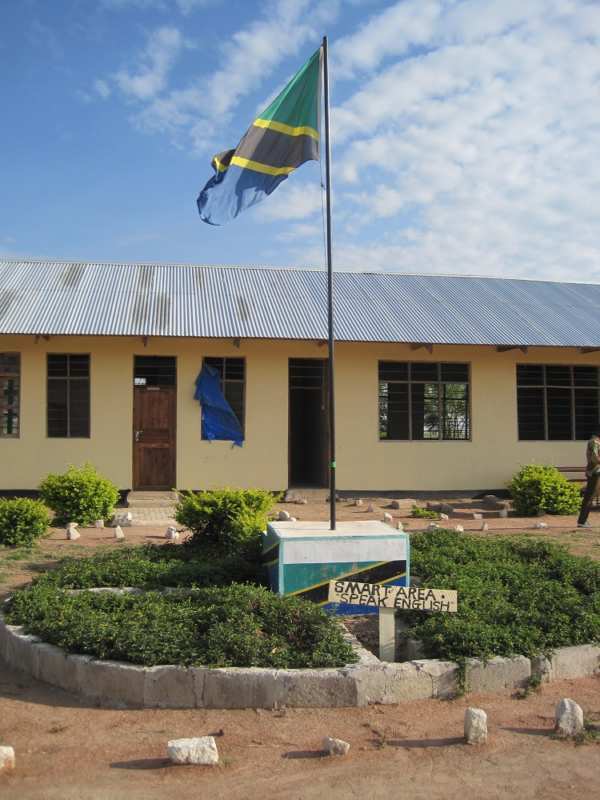 Like most secondary schools in Tanzania, local schools have “Speak English” signs posted around the school grounds. However, I never heard English spoken at the schools other than when a formal lecture was given or someone was addressing me. 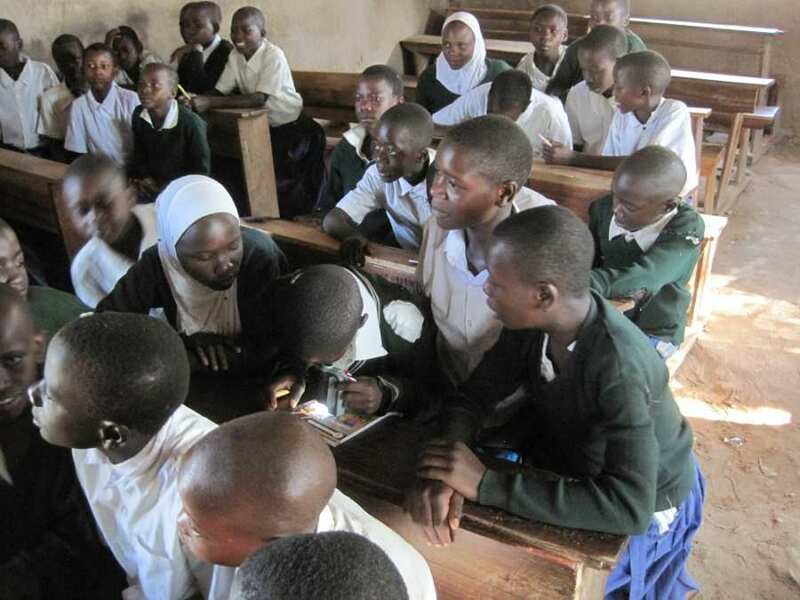 It is understandable that students prefer to use Swahili, but English skills are extremely important in secondary school for understanding classroom instruction. It’s also the language used on the National Exams, which determine whether a student is eligible to continue their schooling or not. Much of a student’s poor exam performance can be attributed to poor skills in the English language and is not necessarily representative of their actual learning and knowledge. It is for this reason that Project Zawadi’s English Bridge program is so important. The English Bridge program is a seven-week English intensive workshop. 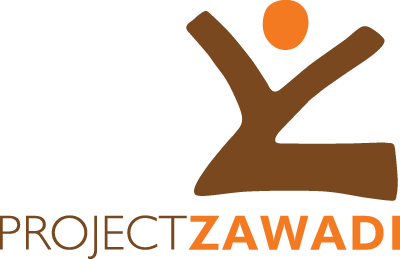 The workshop is offered to Project Zawadi sponsored students and other selected students during the winter break period before they enter secondary school. Designed to give students a leg up in their conversational English skills (speaking, listening, and comprehension), it helps position students for more success as they navigate the transition to secondary school and the new language of instruction. “Smart Area, Speak English” sign at Nyamang’uta Secondary school. Students are very enthusiastic learners and work very hard. The projector was a useful tool for making use of a single computer with many students. The English videos have potential to improve English as well as in teaching science content, especially when using DVDs and enabling English subtitles for students to read along. All the schools were receptive to increasing science activities as part of their science classes. Science is also a priority area for improvement by the Tanzania government. The future is bright for student with a science background. There are many employment opportunities in fields such as nursing and other medical fields, teaching, and engineering. During my time in Nyamuswa, I was fortunate to be able to stay with Project Zawadi Director, Adrian Maganga, and his family at their home. I was welcomed and made to feel at home and it was really nice to be based so close to the schools. I also had the opportunity to take a fun excursion with them to the museum in nearby Butiama, the birthplace of Tanzania’s first President, Mwalimu Julius Nyerere. Asante sana, Adrian and family!